Gripit Floss Holders make flossing an effortless routine. The Gripit Floss Holder holds floss very tightly so users don't have to pinch their fingers or put fingers into their mouths when flossing. 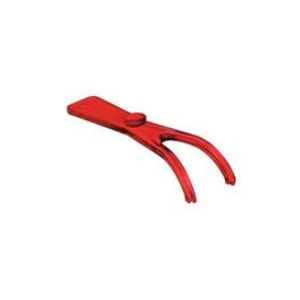 Gripit Floss Holders are the only flossing tool that comes threaded with it's own floss supply and then pops open to allow a fresh length of floss to be advanced in seconds. 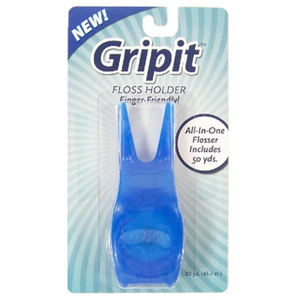 Gripits are also ergonomically designed to help people with arthritic conditions floss more easily. Preloaded with Waxed Unflavored floss. Refill with your favorite waxed unwaxed or flavored floss and most dental tapes. Make sure the floss crosses the locking teeth. Thread the floss inside the guide. Thread the floss along the prong. Loop the floss under the notches at the tip of the prongs. Thread the floss back along the other prong. Loop the floss inside the second guide. Make sure the floss crosses the locking teeth a second time. Thread floss out the exit slot marked and snap your Gripit closed. To advance fresh floss, pop open your Gripit slightly to unlock the gripping teeth. Pull the floss tail until fresh floss is in place. Snap your Gripit closed. Remove excess floss with the cutter on the back. Remember to leave a little extra tail length, which will make it easier to grip when advancing fresh floss.